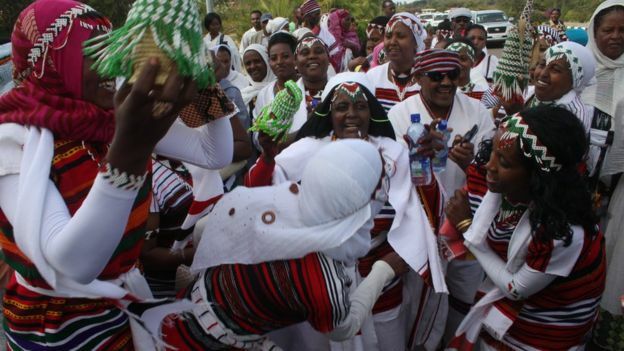 Ogaden News Agency (ONA) – Why is the Ethiopian diaspora so influential? During a year of anti-government protests throughout Ethiopia, its global diaspora, particularly that in the US, has been deeply involved – and not just vocally, writes Addis Ababa-based journalist James Jeffrey. Twitter and Facebook have been blocked since a six-month state of emergency was imposed last month as the government tries to restore order across the country’s two most populous regions of Oromia and Amhara. There are also internet blackouts, primarily targeting mobile phone data, which is how most Ethiopians get online – and is for many residents of the capital, Addis Ababa, the most frustrating effect of the security clamp down. The ruling Ethiopian People’s Revolutionary Democratic Front (EPRDF) has singled out social media as playing a key role in the latest unrest which broke out in November 2015 and which resulted in millions of dollars’ worth of damage across Oromia, the region where the protests began. But internet restrictions may have less to do with silencing Ethiopians at home than with stymieing influence from abroad where those in the diaspora energetically follow and respond to events. “The diaspora have the freedom to speak freely, assemble and organise under the constitutions and laws of the countries in which they reside,” says Alemante Selassie, emeritus professor at the William and Mary Law School in the US. Ethiopia’s global diaspora is estimated to be two-million strong, with the highest numbers in the US, totalling anything from 250,000 up to about one million. “The protesters are their brothers, sisters, aunts, uncles, classmates, neighbours and former colleagues,” says Hassan Hussein, an Ethiopian academic and writer based in the US state of Minnesota. “Most activists in the diaspora are people pushed out of the political process and into exile by the current regime in Ethiopia,” says Mohammed Ademo, an Ethiopian-born journalist in Washington DC. Nowadays they are joined by writers, bloggers and journalists who, along with hugely popular satellite television channels broadcast from the US, provide significant coverage about the protests. “The Oromo has no independent voice at home, all the local media outlets, already too few, are either driven out of the country or state-owned,” Mr Hassan says. But diaspora influence goes well beyond media coverage. Huge amounts of money are remitted from the US back to Ethiopia. 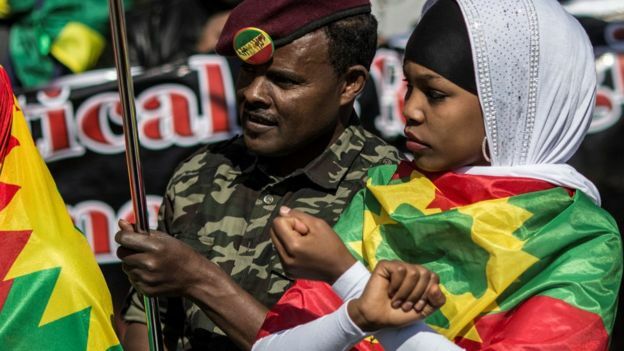 “With the intensification of protests for the past 12 months, the level has probably increased considerably,” says Eloi Ficquet, former director of the French Centre for Ethiopian Studies in Addis Ababa. Opposition groups in Ethiopia gain significant funding from anti-EPRDF diaspora sources because of scant local options. Consequently, according to some, this financial dependency hinders them from attempting political compromise and engagement with the ruling party, which already makes it hard enough. “The government suppresses the peaceful political parties in this country and people became very hopeless about peaceful political struggle,” says Lidetu Ayele, founder of the local opposition Ethiopia Democratic Party. Ethiopia does not just lack effective local opposition. Local independent media does exist – often written in Amharic, hence not noticed by many labelling Ethiopia one of the world’s most-censored countries – but remains severely hampered compared to state media. “The government hasn’t allowed an independent media to develop so people turn to diaspora news,” commented an Ethiopian journalist with a local daily newspaper at an October government press conference. And many in Ethiopia, both locals and foreigners, agree it has become a problem because of the volume of inaccurate or bogus information channelled by social media and overseas activists, often with an all too combustible effect on the ground. Are the protests a game changer? 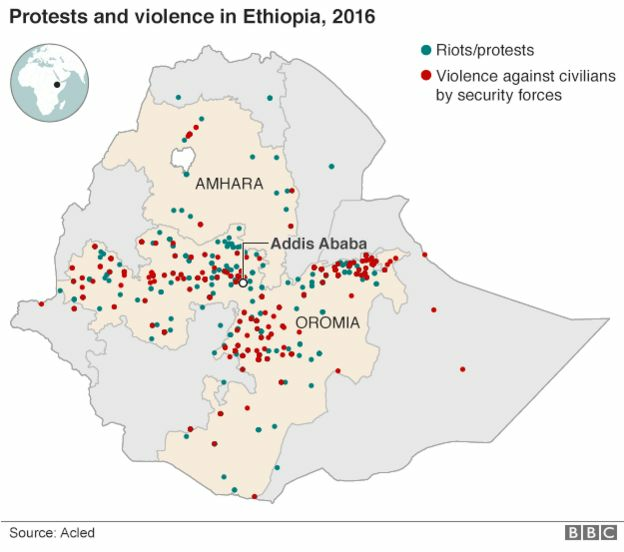 What is behind Ethiopia’s wave of protest? What does unrest mean for Ethiopian unity? Violence at the beginning of October was precipitated by overseas activists calling for “five days of rage” in response to a deadly stampede at an Oromo religious festival after police and protestors clashed. However, others argue the protests have sprung organically from a populace bearing numerous longstanding grievances. “They feel left out of the so-called Ethiopian economic miracle that the Western press touts ad nauseam despite the grinding poverty all around the country, especially the Amhara region,” Prof Alemante says. Among those active on Ethiopia’s social media scene, there is also exasperation at the government’s blinkered approach to the dynamics of modern communication. “They could probably debunk about half the disinformation if they used social media to provide basic answers,” says Addis Ababa-based blogger Daniel Berhane. But instead the government relies on its monopoly of television and radio while leaving social media uncontested, or for now blocked. “If government does respond, usually it’s too late and the accusation has been accepted as fact,” Mr Daniel says. Journalists highlighting such misinformation typically face torrents of abuse on social media from those in the diaspora who accuse them of being in cahoots with the government and failing to see the bigger picture. “Foreign correspondents mostly cover only protests in Addis Ababa,” Mr Mohammed says. 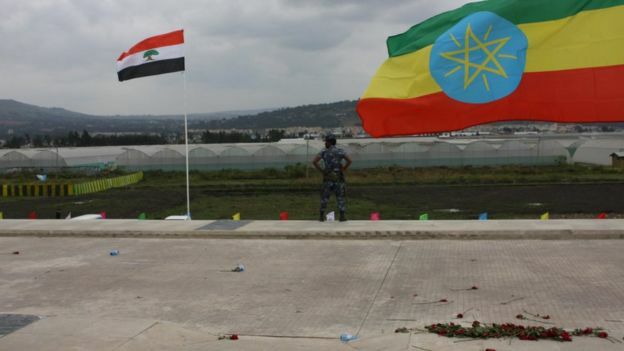 “The diaspora has been instrumental in raising awareness about atrocities taking place [elsewhere] in Ethiopia and reporting on protests,” the journalist says. The state of emergency appears to be having the desired effect of restoring order – for now. The EPRDF conducted a significant cabinet reshuffle at the end of October, while promising further reforms. But the general consensus appears that no-one has a clue what may happen next. “Ethiopia has an enormous and complex set of problems,” says Endalk Chala, one of the founders of the Ethiopian Zone 9 blogging collective. He is currently studying in the US and remains in exile following the arrests in 2014 of several his fellow Zone 9 bloggers, some of whom are still facing trial. “But the government embarked on prescribing simple solutions such as declaring a state of emergency and electoral reforms,” he says.